A clear but crisp start to the day. The ground was frozen with ice on top of the towpath puddles. Obviously good walking conditions. Those muddy fields should be firm under foot. 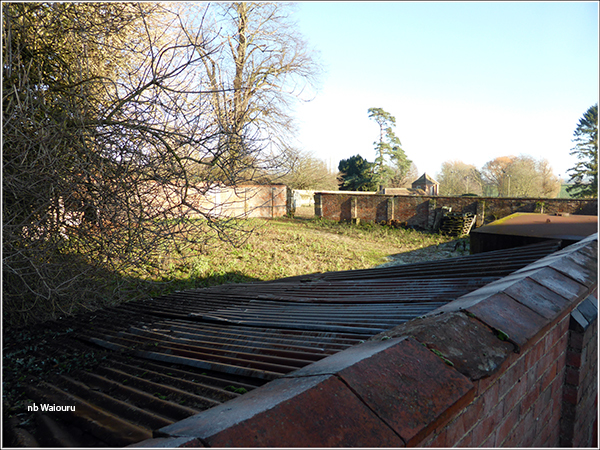 The plan was to follow the towpath to the east of Braunston and record three public footpaths that are not on the OSM. 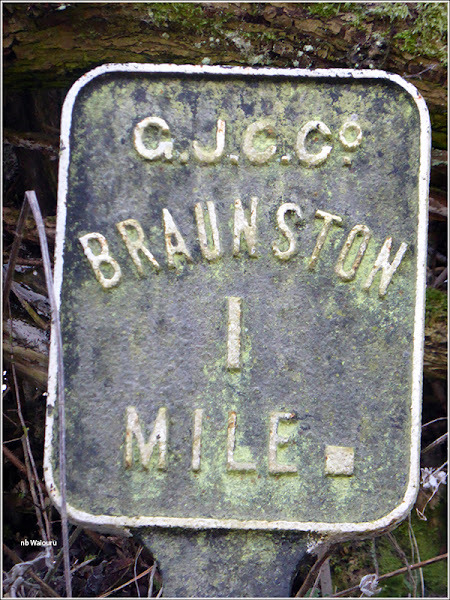 There was a mile marker beside the towpath just above Braunston Top Lock. It was actually set back quite a distance and I wouldn’t have seen it except the cold weather has killed off the surrounding vegetation. I guess most summer boaters wouldn’t see it. 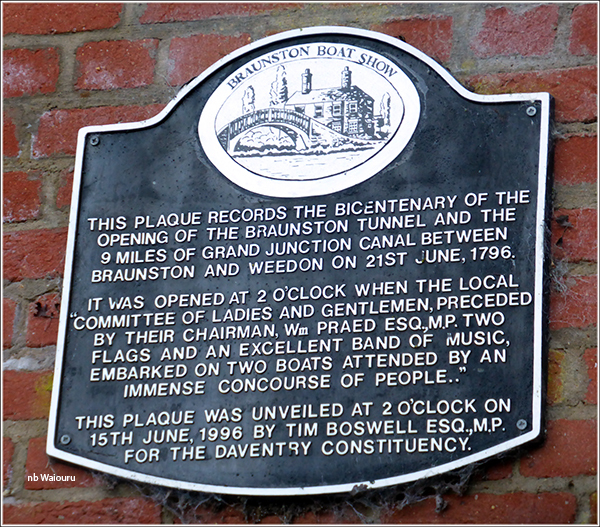 There’s also a plaque on the western end of the Braunston Tunnel Portal. The route took me over the top of the tunnel. It doesn’t have a towpath. 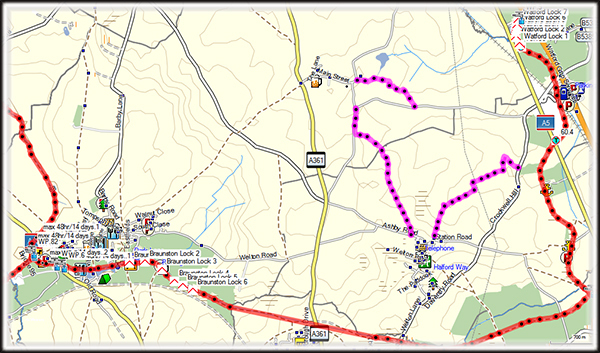 This is a path I’ve previously walked when going to Daventry. It’s not hard to see the tunnel alignment as there are ventilation towers along the route. 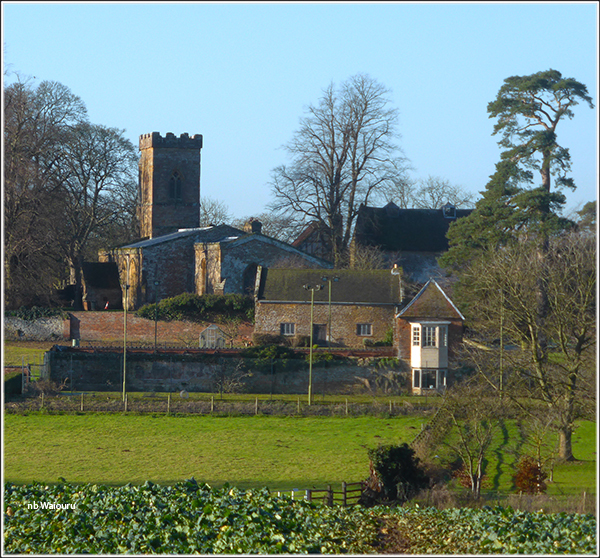 I walked north into Welton Village (very quiet) and out the other side heading NE across the fields. The path made a sharp right turn at a caravan storage park. That got me thinking….. There was a caravan storage area near Watford Locks. That noise in the background was the traffic on the A5 and M1 motorway. 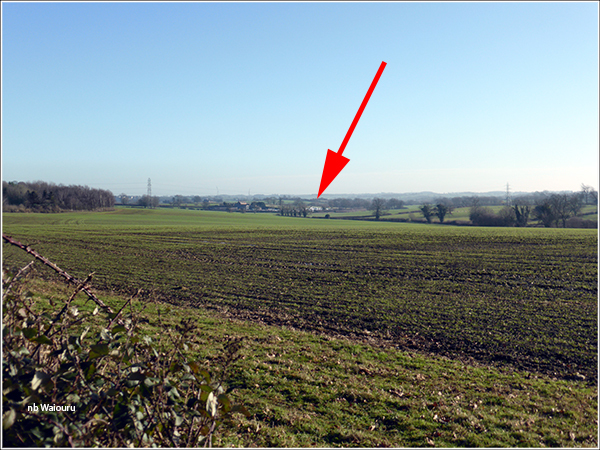 Having recorded the data I retraced my steps to Welton and then headed north on the second footpath. Off to my left there appeared to be a walled manor with a gatehouse. At the far end of the footpath I could see the caravan storage park in the distance along with traffic on the M1 and then glimpses of a Virgin train. I’d completed a large semi circle. The third footpath took me back towards the large manor house. It became apparent that the gate house wasn’t a gate house and looked rather dilapidated. 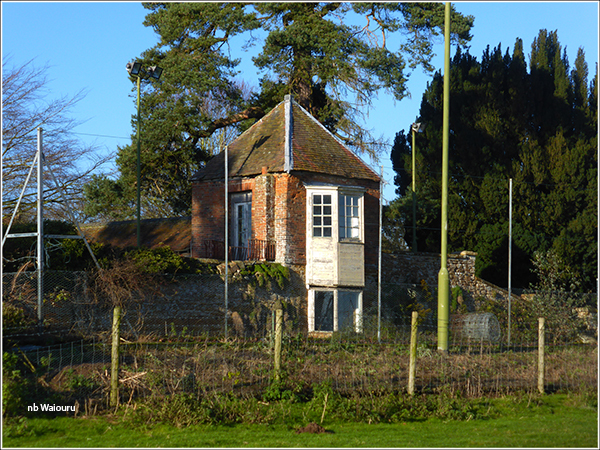 Then I realised the high fence in front of the “gate house” was a tennis court! There wasn’t a road in front of the wall. I’d arrived at the rear of the property. It all looked rather run down. The footpath went down the side of the brick boundary fence but at the stile there was sufficient height to see over the wall and take a photo. 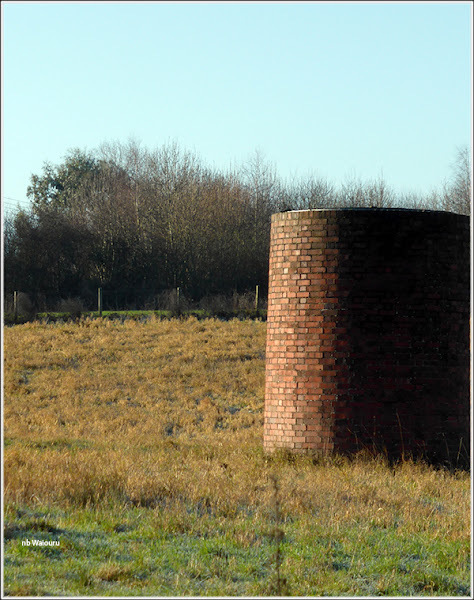 A disused look about the place. As I reached the front of the manor I realised it had its own graveyard. Then I saw the church. 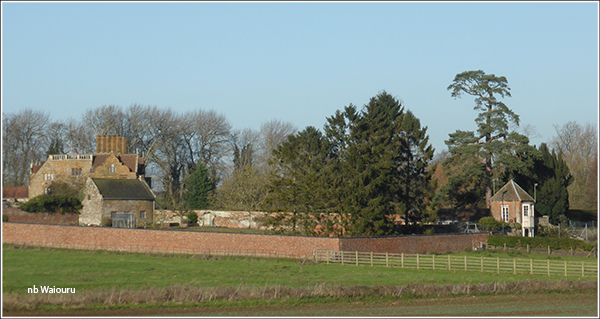 It’s probably not a manor and looks more like a church property in the village of Ashby St Ledgers. 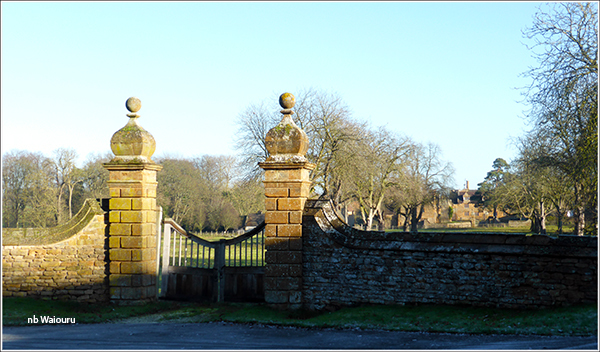 On the far side of the village was an ornate gateway and abandoned driveway. But Google has proved me completely wrong. It is a manor. Actually this is the manor where the major part of the gunpowder plot to blow up the Houses of Parliament was planned. The owner, Robert Catesby was killed and the property confiscated to the crown. It has passed through many hands and eventually Queen Elizabeth II purchased the estate, but not the manor house. This continued to pass through yet more owners until purchased in 1998 by Ivor Guest, 3rd Viscount Wimborne who has reportedly stated it would cost approximately £10m to renovate. 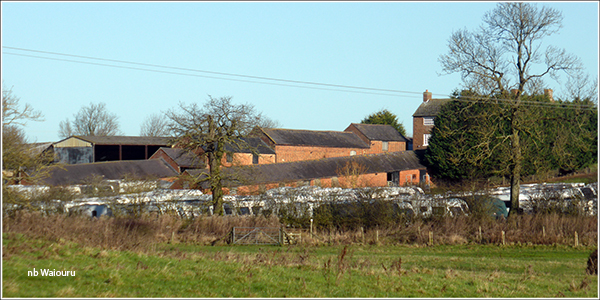 The route back to Waiouru took me in an almost straight line across the fields from Ashby St Ledgers to Braunston. There was quite a good view of Warwickshire from the last ridge. Braunston church spire to the left. If now seen Braunston from all four points of the compass.